Highly efficient 10w / 12V DC output photovoltaic solar panel. 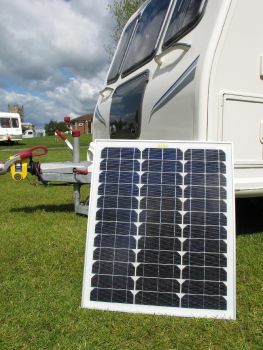 The aluminium frame makes this solar panel ideal for any outdoor application and is capable of generating solar power even in cloudy or overcast conditions. 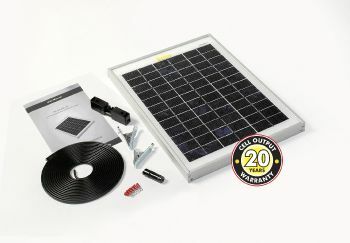 High efficiency 10 watt photovoltaic solar panel. Robust aluminium alloy frame construction. Will operate in all weather conditions (power output will be reduced in overcast weather periods). Silent, Eco-friendly harvesting of the Sun's energy. 5 metre (16ft) DC power cable supplied. 20 Year warranty on cell output performance. 10 year warranty on the Solar Module, for added peace of mind. Ideal for connection to 10 Amp Solar Charge Controller and 7ah Solar Battery. • Output Voltage: 12V DC. • Peak Output: 580mA @ 17.3v.